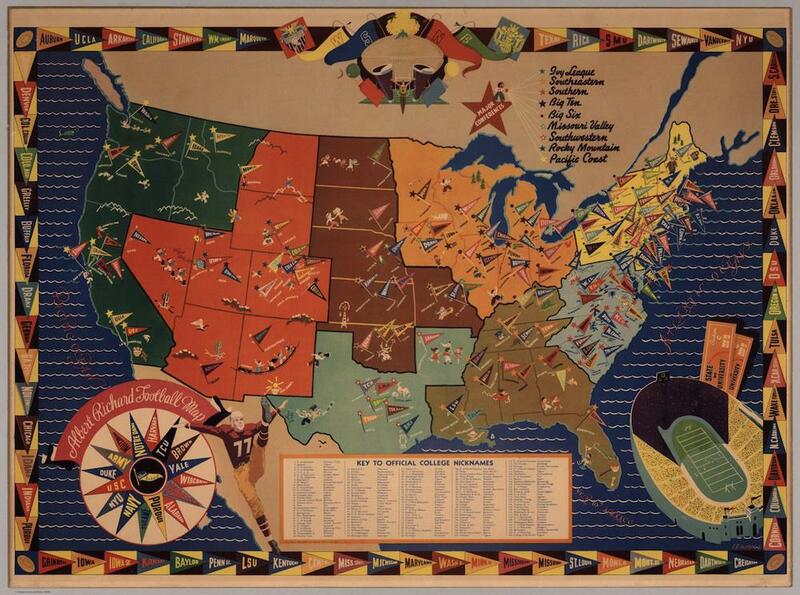 History of college football: Map of teams in 1938. By 1938, when this map was printed, college football was in its seventh decade and had already been the subject of much speculation and analysis, with onlookers fretting over the party culture surrounding it on campuses, investigating the amateur status (or lack thereof) of its players, and scrutinizing its recruitment practices. As the abundance of teams and their widespread geographical distribution shows, neither that scrutiny nor the initial reduction in ticket sales that the first years of the Depression brought had affected the sport’s popularity. The Albert Richard Company, which made outerwear and mens’ wear, printed this souvenir, hoping to ingratiate themselves with customers who watched (or played) football. In an ad in Life Magazine, printed in October 1937, the company advertised a heavy plaid mackinaw coat with a drawing of a bundled-up sports spectator holding a megaphone. “Men of action demand Action-Fit…true freedom of movement,” the copy read. The map numbers the college pennants spread across the states, which are interspersed with cavorting figures of fans, cheerleaders, and players. The numbers correspond with a key at the bottom of the map, offering the “official nicknames” of each team. I first saw this map in an exhibit about maps and American culture, on the Digital Public Library of America’s website. Click on the image or visit the map’s page on the David Rumsey Map Collection’s website to zoom.